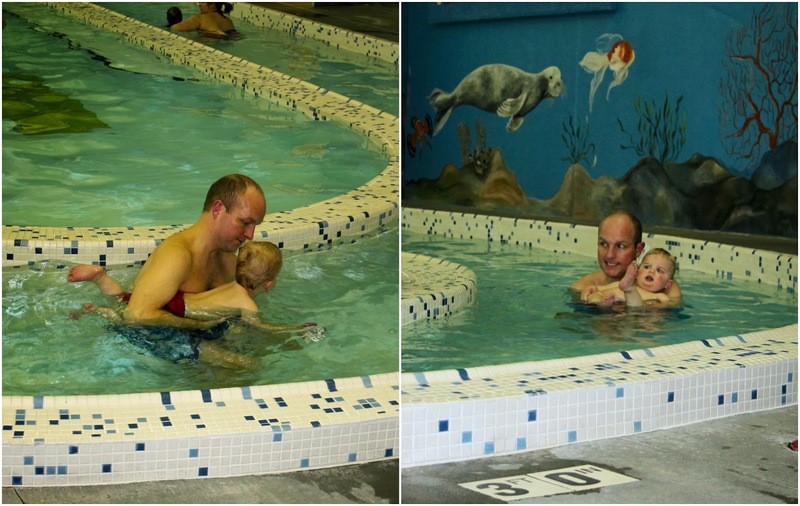 In January, I had the fun idea to sign Brantley up for swim lessons. He's always been a fan of bath time and he enjoyed his time at our neighborhood pool last summer. 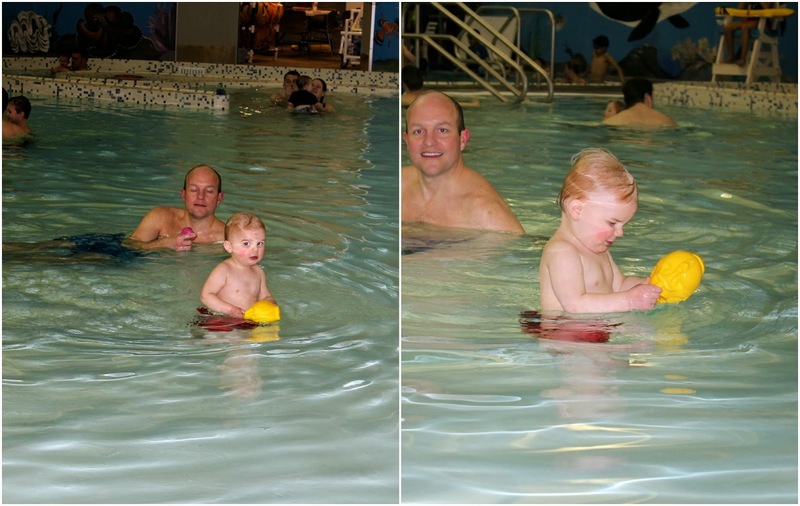 Not that swim lessons for a 1 1/2 year old really teach much, but 1) we want Brantley to feel comfortable/confident in the pool as he grows up, 2) you can never start too early, and 3) I thought the lessons would give us something to look forward to in the dead of winter. Initially, I signed up for Wednesday nights in February. But then we got hit with that huge winter storm four weeks ago. Because the lessons continuously start over every four weeks, our session that was snowed out was not rescheduled. So, I asked to change our lessons from February to March instead! So here we are! Night one was last night. 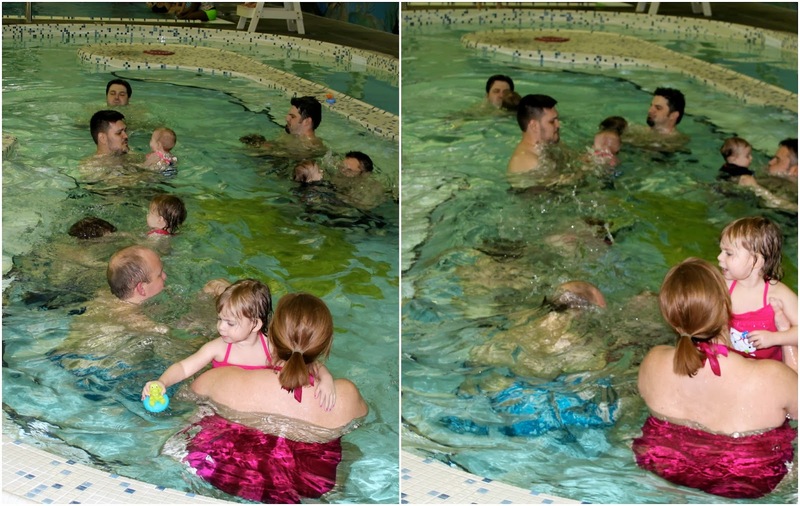 Brantley loved splashing around in the pool with the other 18 month to three year olds - or the Starfish group as Blue Valley Rec calls them. Together with Daddy, he spent 30 minutes floating on his tummy, floating on his back (didn't love), singing songs, wading in two feet of water, and even going down for a few dunks! I'm also happy to report that he was a very good student and listened every time his teacher spoke. According to Craig, he kept repeating 'teacher' anytime they swam past her! He sure makes his mama proud! Night one of swim lessons = a success! Three sessions to go until we have ourselves a Starfish graduate! I knew I recognized that place! Way to go Brantley! I love this!!! I tried to get Charlie signed up for lessons through Olathe Parks and Rec and the session we were going to do is full - BOO!! 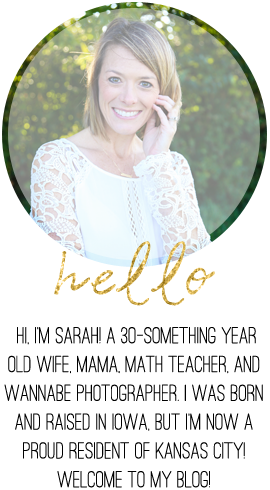 So I looked at Blue Valley Rec and think we are going to do the same class!! Glad to here you like it!! !